Android is continuing to dominate the smartphone arena while the fight between BlackBerry and Windows Phone begins to hot up, according to the latest stats from IDC. It's no secret that Android is the biggest mobile operating system and as of the last three months of 2012 the Google-made platform apparently accounted for a huge 70.1 per cent of the smartphone market. Apple's iOS still remains comfortably in second place with a 21 per cent market share, but that's 2 per cent less than during the same period in 2011. 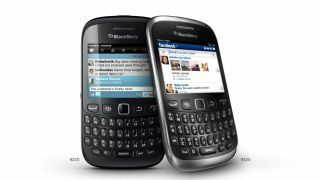 Unsurprisingly BlackBerry witnessed the biggest drop between fourth quarters from 2011 to 2012 with its 8.1 per cent share falling to 3.2 per cent at the end of last year. Despite this the BlackBerry OS still remains in third place, just ahead of Windows Phone which is currently growing and now controls a 2.5 per cent stake in the market. BlackBerry will be hoping to claw back some of that lost ground this year off the back of its new BlackBerry 10 platform, while Microsoft will continue the Windows Phone 8 push. But can anyone catch Android?